She was scary, a queen and most importantly she was "Sensational." Sherri Martel's loud screams tormented the minds of fans and her enemies for years. Trained by The Fabulous Moolah, Butch Moore and Donna Christanello, Sherri Martel's fiestyness inside and outside the ring has influenced many women performers of today. Sherri's fashion sense and her trademark dramatic eye makeup has been adorned by many women performers of today. Not only was Sherri a great in ring perfomer but she considered one of the greatest managers of all time managing everyone from Tracy Smothers to Kevin Sullivan to Ric Flair to "Macho Man" Randy Savage to "Million Dollar Man" Ted DiBiase to Shawn Michaels and so many more. Sherri Martel became more of a threat at ringside to her client's opponent than her client, known for mixing it up in the ring Sherri would do anything even putting herself in harm's way to make sure her man picked up the victory. Sherri Martel will always be remembered for helping pave the way for women the world of professional whether its managing or wrestling. Sherri Martel first gained national exposure while competing for the AWA. On September 28, 1985, Sherri Martel defeated Candi Devine to capture the AWA World Women's Championship at AWA's "SuperClash." Sherri would hold the championship on two more occasions before vacating the championship on July 25, 1987 when she left for the WWE. Sensational Sherri defeated the reigning WWE Women's Champion The Fabulous Moolah for the WWE Women's Championship on July 24, 1987. Sherri would lose the championship to Rockin' Robin months later on October 7, 1988. At Survivor Series 1987, The Fabulous Moolah, Velvet McIntyre, Rockin' Robin and the Jumping Bomb Angels defeated Sherri Martel, Donna Christanello, Dawn Marie and The Glamour Girls in a traditional survivor series tag team elimination match. As the WWE began to phase out the women's division towards the end of the decade, Sherri turned her full attention to becoming a fulltime manager to the WWE Superstars. Wrestlemania V on April 2, 1989, Sherri Martel confronted Miss Elizabeth which lead to a brawl between Hulk Hogan and the now heel Randy Savage. Sherri would become the new manager for Randy Savage and continue to feud with Miss Elizabeth and Hulk Hogan throughout the remainder of 1989. On April 1, 1990, Sherri and Randy Savage lost to "The American Dream" Dusty Rhodes and Sapphire in a mixed tag team match at Wrestlemania VI. Sherri Martel and Randy Savage would soon split after Sherri Martel attacked Savage after his "retirement" match with the Ultimate Warrior at Wrestlemania VII. Miss Elizabeth would make the save and throwing Sherri out the ring. Sherri Martel went on to manage the "Million Dollar man" Ted DiBiase before moving onto to manage Shawl Michaels. In a memorable moment from 1992, Marty Jannetty accidently hit Sherri martel with a mirror forcing Sherri to be absent from television until the Royal Rumble 1993 where she turned on Shawn Michaels during his match with Marty Jannetty. Martel would engage in feud with the new valet for Shawn Micheals, Luna Vachon after Vachon attacked her at Wrestlemania IX. 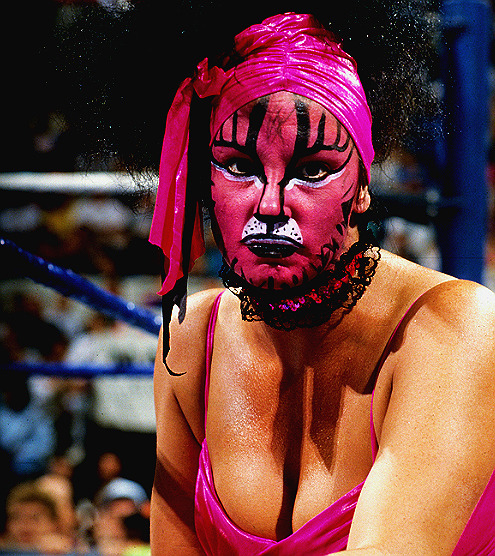 Martel would align herself with Tatanka who aided her during her back and forth feud with Luna Vachon and Bam Bam Bigelow before departing from the WWE. In 1993, Sherri Martel started working in ECW managing Shane Douglas and even had a one off match against Malia Hosaka. Sherri would leave ECW for WCW. Debuting in WCW as "Sensuous" Sherri, she became the new manager for Ric Flair aiding him in his feuds with Sting and long time rival Hulk Hogan. "Sister Sherri" managed Harlem Heat to seven WCW World Tag Team Championship reigns. Sherri even had a brief on-screen romance with Col. Robert Parker before departing from WCW. Sherri would continue to appear on the independent scene over the years and even helped train alot of women wrestlers and even reappear in WCW in late 2000 taking on Mona and Madusa in matches. Before her death in 2007, Sherri Martel was inducted into the WWE Hall of Fame in April 2006.